You’re invited to a house party! A luxury home will be the centerpiece of an auction party from 3 to 5 p.m. SLT Friday, Oct. 26 to benefit cancer research through the American Cancer Society and MSABC across SL. Tour the house, then place your bid! Entertainment will be provided by DJ Nuala Maracas of T1 Radio. If you can not make the live auction event and would like to bid higher if outbid, contact Leala Spire-Marchant (leala spire) to arrange bid by proxy. At the party, all bidding will be in posted in open chat and the starting bid will be the current highest silent bid. Highest Bidder at end of event will be asked to pay the Strides Kiosk to receive their home. All proceeds collected during the Strides Parade of Homes in Second Life and the night of the Auction Party will go directly to Making Strides Against Breast Cancer and the American Cancer Society. But wait, there’s even more fun! Perfect for those wishing for a smaller home but not wanting to scrimp on luxury. This entry was posted in american cancer society, making strides, second life, Uncategorized and tagged 2018 Making Strides Against Breast Cancer in Second Life, american cancer society, breast cancer, breast cancer awareness month, cancer, Live Auctions, Making Strides Against Breast Cancer, making strides against breast cancer across second life, Strides 2018 on October 25, 2018 by Serina Juran. As you go through cancer treatments, many find themselves dealing with additional emotional issues aside from the physical side effects of treatment. These emotional issues can also arise after treatments are finished. For women dealing with breast cancer, these issues are sometimes amplified even more from the changes to their bodies as a result of treatments. Finding a good support system to help you through this period on your journey is key to helping navigate these times. For those breast cancer patients and survivors in Second Life, there is the ACS Cancer Survivors Network inworld. This is a peer to peer support group, connecting people who have fought cancer who will provide support, advice, and encouragement to cancer patients in Second Life who are undergoing treatment and other survivors. For all breast cancer patients and survivors there is also the Reach To Recovery program available through the American Cancer Society. The most important thing to keep in mind is you are never alone. 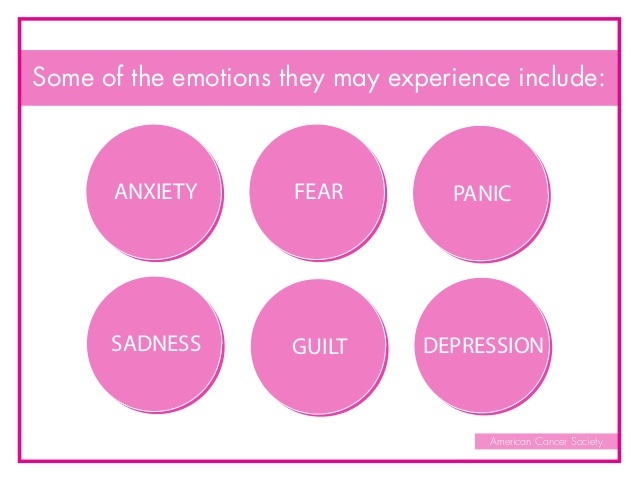 To learn more about Emotions & Breast Cancer visit cancer.org. This entry was posted in american cancer society, making strides, mission, second life and tagged #acs, #American Cancer Society, #breast cancer awareness, #cancer, #TEAMMSABCofSecondLife, 2018 Making Strides Against Breast Cancer in Second Life, ACS, american cancer society, awareness, breast cancer, breast cancer awareness month, cancer, Making Strides Against Breast Cancer, making strides against breast cancer across second life, mission, MSABC, survivors on October 22, 2018 by sandieloxingly.